Locals got a glimpse last night of the spectacle the Mbantua Festival will be presenting on October 9 to 13. The magic of the sun setting on the rocks by the Telegraph Station waterhole was the backdrop for dances (see video) by Arrente women and men, to the chanting and clicking of boomerangs by a group of men sitting under a gum tree on the banks of the Todd. The festival takes it cue from the $3m Yeperenye Federation Festival in 2001. While that was held at Blatherskite Park and had a bucket load of Canberra money, this year’s fixture is smaller, organised by a local Aboriginal company, All The Perks – a reference to the Perkins family, including Krystal Perkins and her dad Neville – and it will be held at the Telegraph Station. Another notable difference is that the Mbantua Festival is going to be bi-annual, and “The Perks” are hell-bent to turn it into one of the town’s prime tourist attractions. Well-known film maker Rachel Perkins and Nigel Jamieson, of Sydney Olympic Opening Ceremony fame, are on board as co-artistic directors. 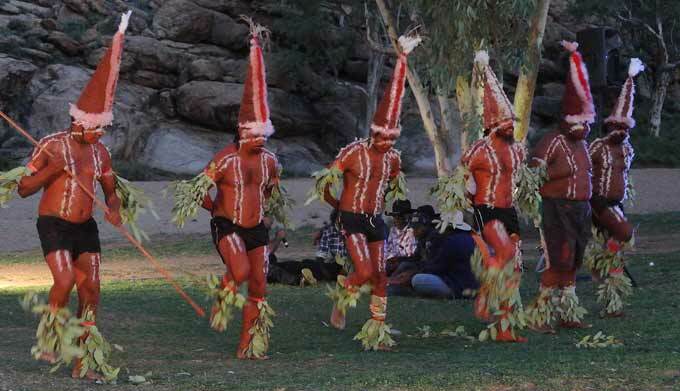 Krystal Perkins says there will be more than 16 Central Australian Aboriginal groups, and Indigenous dance groups from around Australia “to celebrate desert living heritage and culture through a major corroboree and healing spectacle”. Held over five days, the event will coincide with the Australian Indigenous Tourism Conference and will showcase a feast of traditional and contemporary Indigenous performance, bush foods, arts and crafts, exhibitions, and major concerts featuring collaborations between Indigenous and non-Indigenous artists. The event will include newly commissioned theatre works, film, landscape installations, a large concert in the bed of Todd River, collaborations with Indigenous musicians and artists from around the world and a mass spectacle featuring 2000 local people telling the great Caterpillar Dreaming that formed the landscape of Mbantua – Alice Springs. Organised by the Arrulka Business Corporation (ABC) and supported by Arrernte Leaders and Central Australian Aboriginal groups, the festival received initial seed funding through the Centrecorp Foundation and a Federal Government grant of $841,000 from the Aboriginal Benefits Trust Account. PHOTOS, top: The Ltyentye Apurte (Santa Teresa) Dance Group. 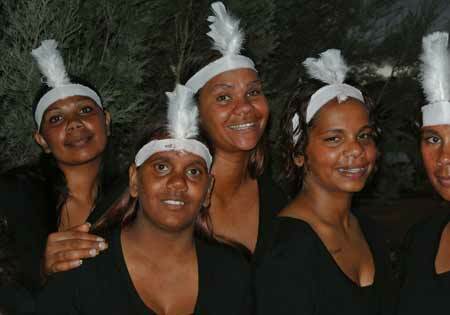 Centre: Members of the Mpwereingke Anapipe dance troupe, Naree Riley, Ainslie Gorey, Miranda Doolan, Sheena Turner and Anya Riley.